Bernard Zimmel began his real estate career in 1953 after serving in the Korean War. Newly wed and recently discharged from the United States Army Signal Corps, he obtained a sales position with Blau Berg. Through dedication and a strong desire to do well, he became a successful broker with clients in New York and New Jersey. 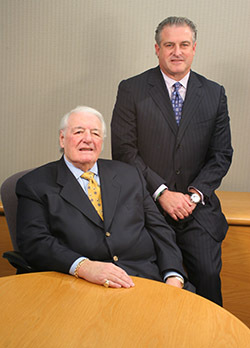 He co-founded Zimmel Associates in 1986 with his son and partner, David Zimmel, president, Zimmel Associates. A true innovator, Bernard Zimmel was the first proponent of the flex space concept, which changed the face of commercial and industrial space in the state of New Jersey. His client list was a Who’s Who in New Jersey Business. After serving the corporate real estate industry for more than five decades, Bernard Zimmel’s vast knowledge of the industry, the ebb and flow of real estate cycles, and the art of negotiation will be missed by his business associates and friends. His expertise and insight played a critical role in building one of the New Jersey’s most successful brokerage firms.